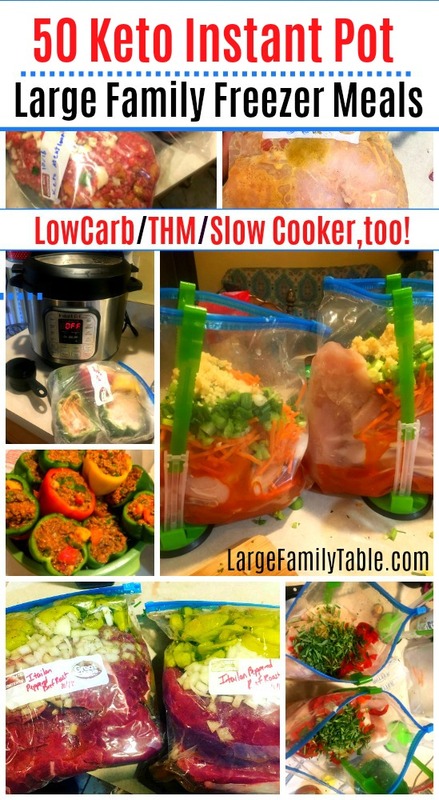 This Large Family Stuffed Peppers Instant Pot Freezer Meal is healthy, low carb, Keto and Trim Healthy Mama S meal friendly! 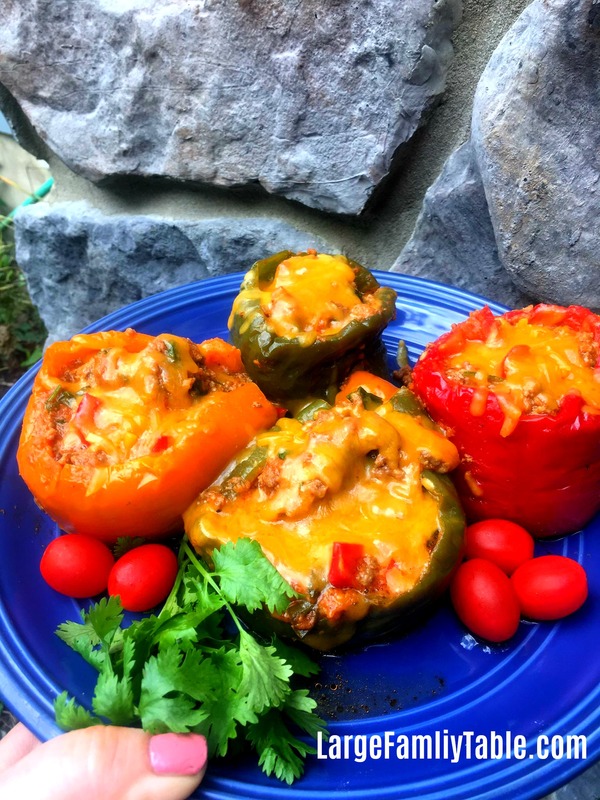 For family members sticking to the low carb side of life these stuffed peppers are perfect as pictured below. For children and non-low carb family members just add in some buttered steamed brown rice as a hot side dish. These simple and easy Stuffed Peppers for the Instant Pot or Slow Cooker are a delightful family meal! Mix precooked ground beef, pasta sauce, diced onions, minced garlic, salt/pepper well in mixing bowl. Place 4-5 stuffed peppers in a gallon freezer bag, label with date and directions. Making this complete recipe as follows you will have about 4-5 gallon freezer bags full of stuffed peppers. 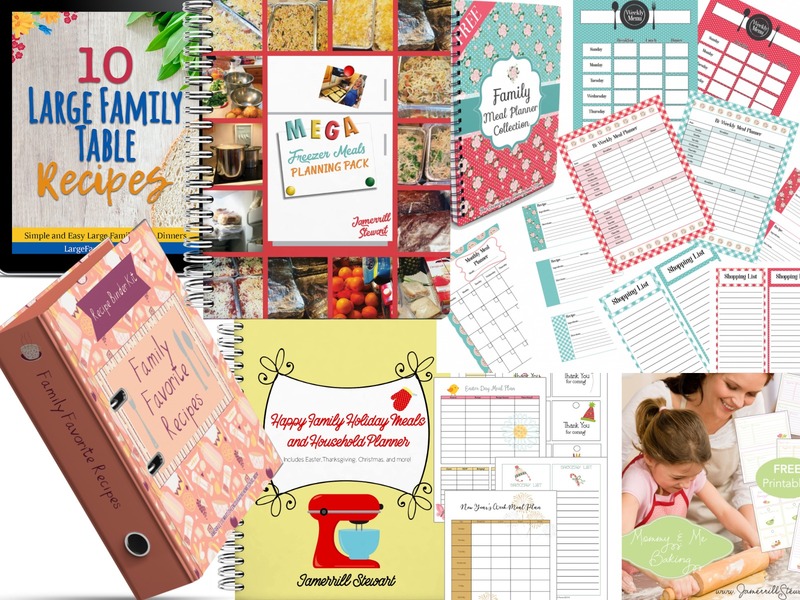 This recipe will make two large family freezer meals. INSTANT POT DIRECTIONS: Add 1 cup tomato sauce to the bottom of IP, place peppers on wire wrack insert on top. Cook in Instant Pot from frozen on manual high for 7 minutes with natural release. Once done cooking open lid and sprinkle pepper tops with shredded cheese. Close lid for 1 minute to allow cheese to melt. Carefully remove stuffed peppers from cookers. Serve with fresh vegetables. 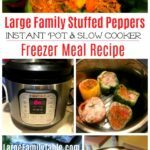 If you love this easy Large Family Stuffed Peppers Instant Pot Recipe you are sure to love these 50 Large Family Keto Instant Pot Freezer Meal Recipes here! The instructions don’t specify when to add the 12 cups of pasta sauce. I am assuming that you add it in Step One…?